Here we are with the final Mantis Radio of 2007. 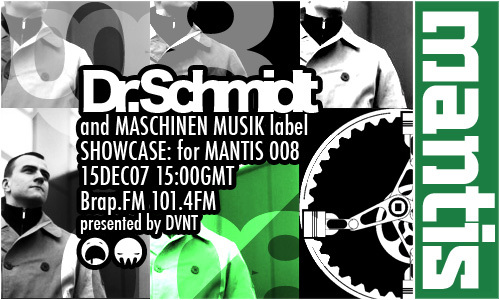 Round 8 and a showcase from Dr Schmidt and his tech breaks label: Maschinen Musik. Music done with machines and that sounds like machines: Based on this idea, Maschinen Musik was founded in 2003 by German DJ and producer Andreas Schmehl (Dr. Schmidt) to fill what he felt was a gap in the broad spectrum of electronic dance music. With the desire to promote a new vision of electronic music, a vision in which Techno, Breakbeats, Electro, and Industrial come together to form a new, raw sound, we created a label that is anchored in both the Techno and Breakbeat scenes. 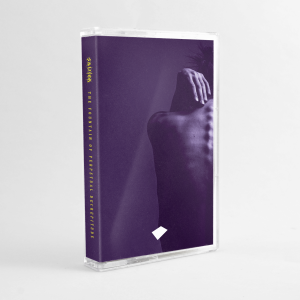 Today, Maschinen Musik provides a professional platform for artists that think outside established patterns and who share the love for dark, powerful, and yet danceable music. The Maschinen Musik crew has created a unique sound between Techno and Electro with the high production level of UK Breakbeat or Drum n Bass, and takes special pride in the outstanding individual artwork for every new 12inch vinyl record. What a way to see out the year. Another fantastic showcase mix of which either side of it DVNT provided the usual range of electronic sounds, including this time around new pieces from DST, DirtyBass, Ohmwerk, NX2U, Drift, Kontinent, and Si Begg with a very special festive bass beast. As well as older tunes from the likes of Tim Wright, Sir Real, Youri and Danny C, Leftfield, Virus Syndicate and Saul Williams. A massive thanks to all our listeners, podcasters, and most of all the showcased artists and the musicians who put together so much amazing music. Apologies for the microphone issues throughout. From the new year, 19th Jan, Mantis Radio is going bi-weekly and down to 2hours. So tune in on Brap.FM from 16:00GMT and get your fix of darkfloor electronics, as provided by DVNT and the showcased artists. Once again thanks to everyone, have a wicked Christmas and we’ll see you in the New Year.